Emigration has been a constant theme for musicians throughout history, with composers moving between countries and continents for a wide range of reasons. In our current concert series, we explore the journeys émigré composers have made through their musical output, whose sounds and atmospheres often reflect and have become associated with their life travels. 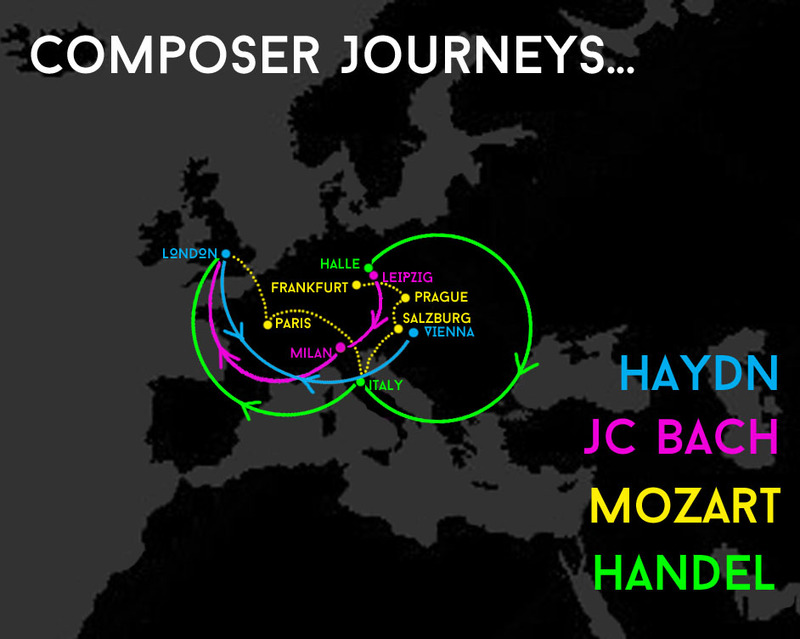 As part of our blog series, Composer Journeys, we’ve been mapping out the journeys these émigré composers have made. For our final concert of the series on Tuesday 16 June 2015, we explore the music of the many composers who fled to Georgian London for fame and fortune. Handel and JC Bach (son of the famous JS Bach) both made their home in London, having bid farewell to their friends in Leipzig and stopping to work and absorb the culture of Italy on the way. Although never relocating to England, Haydn visited frequently to appease his loyal and enthusiastic London audiences. He wrote his famous ‘London Symphonies’ during this time, one of which (‘The Clock’) we perform on 16 June. It is said that Mozart spent over ten years of his life on tour, visiting some of the most important European cities of the time to show off his talents. His travels started at a very young age, with his father dragging him from city to city where he was proudly displayed as a child prodigy. London’s rich streets were a must on their tour and he wrote his Symphony No. 4 when he first came to visit, which we also perform at Shoreditch Church later next month. Previous PostÉmigré stories: Nancy HitzigNext PostWhy should UK orchestras tour internationally?